Goodness gracious! Thanks everyone for all of the well wishes! We are just thrilled to be adding to the family! Penelope (although she might not know it yet) will be a great helper when the precious bebezinho arrives. I didn’t make pleats for her apron or really do anything special at all. It’s just a rectangle with the top two corners corners cut off. I did get slightly tricky (or lazy –however you want to look at it) and used elastic for the neck piece. I couldn’t find any velcro or buttons I liked in my stash of notions, so elastic seemed like the best option. It’s great because I don’t have to worry about tying anything; I just effortlessly slip the apron over her gigantic head. I love her little apron! And I love the fact that your daughter wears skinny jeans! Too cute! love it :) you need a shot of you two together now. I love that second picture! It’s priceless. Oh I love it. 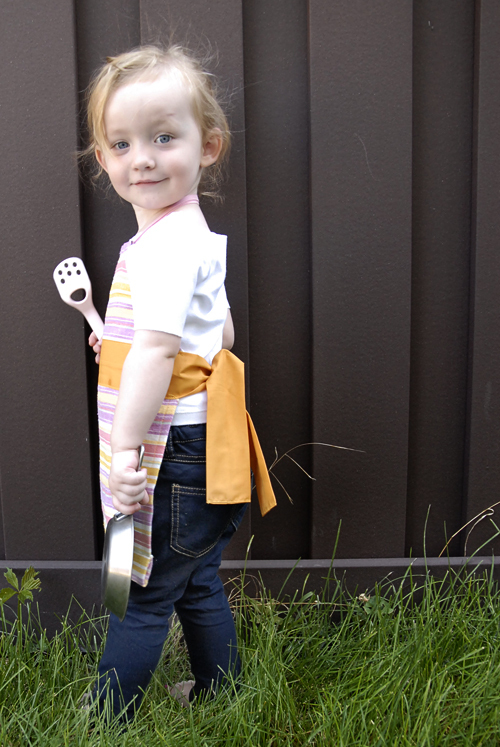 I kind of can’t wait until my little Lou wants to help in the kitchen and I have an excuse to buy her a cute apron (I don’t have a sewing machine… I know it is a shame). Her expression in the second photo melts me! She’s all: Baby? I can handle that. Cute town! Love the giant ties. And that is a genius idea, the elastic. I have used thicker twill tape and d-rings before, but to have it just slip over the head is so much better! Now to find cute colored elastic…thoughts? Your Nelly pictures keep getting better. These are the cutest. haha that smirk that she is rocking is classic! Older sisters are the best,I can’t honestly tell you where I would be without mine!! Pomaikai with the new keiki! Holy hay..Pen is TOO cute in that second picture. I mean- what a look!